Pro-choice advocates protest in front of the U.S. Supreme Court building Friday in Washington, D.C.
March for Life wants law that protects life from "biological beginning"
Washington (CNN) -- Abortion rights supporters and opponents hit the streets of the nation's capital Friday to mark the 37th anniversary of Roe v. Wade, the landmark Supreme Court ruling establishing a woman's constitutional right to terminate a pregnancy. Anti-abortion activists held a rally on the National Mall and marched to the Supreme Court, followed by a walk to Capitol Hill to urge legislative action. An annual March for Life has been held in Washington since 1974. "We want to change people's hearts and minds and help them to know that abortion ... is not necessary and really undermines the rights of women," U.S. Conference of Catholic Bishops spokeswoman Deirdre McQuade told CNN. "We're working toward the day when abortion will not only be illegal but unthinkable." Abortion rights supporters, led in part by the National Organization for Women, planned their own rally and vigil on the steps of the high court. "A fetus is not a life, sorry," NOW President Terry O'Neill told CNN. "And no, nobody's religious conviction justifies taking women's ability to shape their own futures away from them." Activists on both sides of the highly divisive issue believe there is a chance the conservative-leaning high court could eventually overturn the 1973 ruling. 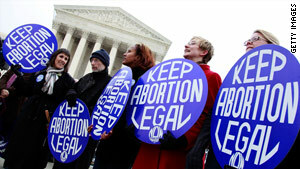 Questions regarding abortion rights have played a key role in the health care reform debate. A number of abortion rights supporters believe a bill passed by the House of Representatives in November does not do enough to provide access to reproductive services. Many abortion rights opponents say legislation approved by the Senate in December does not go far enough to ensure taxpayer dollars are not used to fund abortions. CNN's Paul Courson, David de Sola and Alan Silverleib contributed to this report.